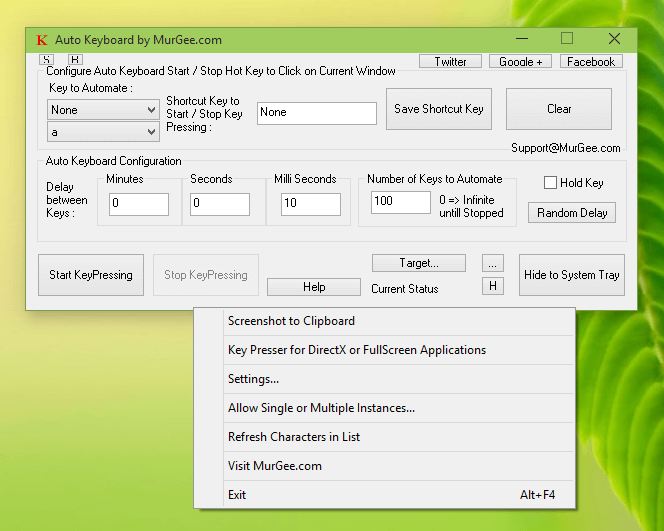 Send single or multiple Keystrokes to selected Application with Auto Key Presser Utilities. This post offers few Applications which can help you Automate Typing on Keyboard. Whether you need to fill Forms on websites, send a single keystroke to a Game, or send Multiple Keystrokes in sequence using a Macro Script, the Key Presser Applications offered here can really be of help. Let’s start with simplest Key Presser which is a small Utility to send a Keystroke repetitively to Active Window or to a Selected Window. The Screenshot of Auto Keyboard Utility as given below has been captured on a Windows 10 Computer, however you can use this Auto Key Presser Application on other Windows Operating Systems like Windows 7, Windows 8, Windows 8.1 and of-course on Windows 10. Watch a Short Video Tutorial displaying how to configure and use Automatic Key Pressing, alternatively read on to know more. Auto Keyboard Software Utility to send a single Keystroke repetitively. This Key Presser is especially useful when you wish to send a single keystroke to an Application Window with fixed or random time delay in between. The Number of Keystrokes to send is configurable and can be controlled with a System Wide Keyboard Shortcut as displayed in the screenshot above. By default the Action Application Receives Keystrokes, however if you would like to send the keystrokes to an application window which does not have keyboard focus, you can change the Target Window and the Auto Keyboard will send Keystrokes directly to the Application Window selected. Yes, you can even launch multiple instances of Auto Keyboard and configure different instances to send different keystrokes. Alphanumeric Keyboard Keys, Number Keys, Keypad Keys and other Special Keyboard Keys like Function Keys, Backspace, Arrow Keys and many more are supported by this Auto Key Presser. Download the Auto Keyboard Utility on your Windows Computer and give your fingers a rest. Whether you are running 32 bit version or 64 bit version of Microsoft Windows 7 or Later (upto Windows 10), you can enjoy all the features offered by this Key Presser Software. 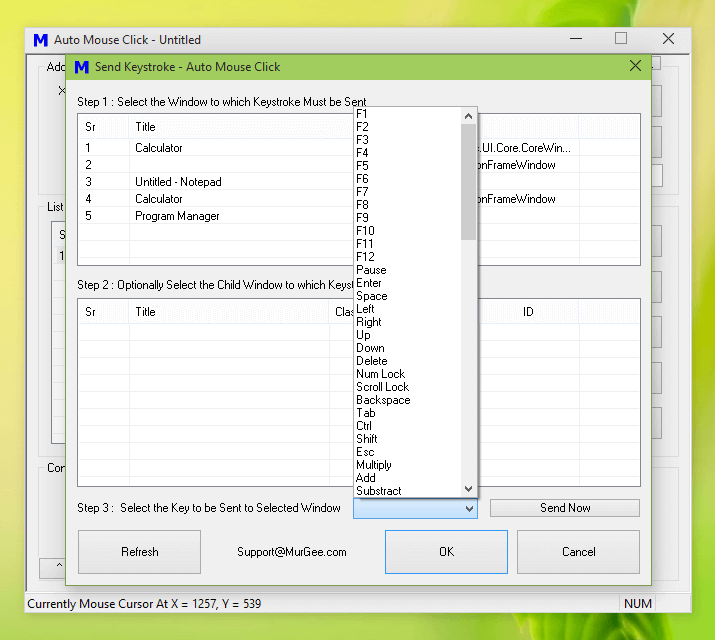 For Sending single or Multiple Keystrokes to an Application Window with the help of a Macro Script, you can use the Auto Mouse Click Software Utility. As displayed in the screenshot above, a Send Keystroke Action has been added to the Macro Script. The Time Delay between consecutive Key Press is configurable and so is the number of times you wish to send the Keystroke. As the Auto Mouse Click allows you to create a Macro Script, you can add Multiple Actions for sending Keystrokes and yes each Send Keystroke Action can have it’s different configuration as displayed in the screenshot below. 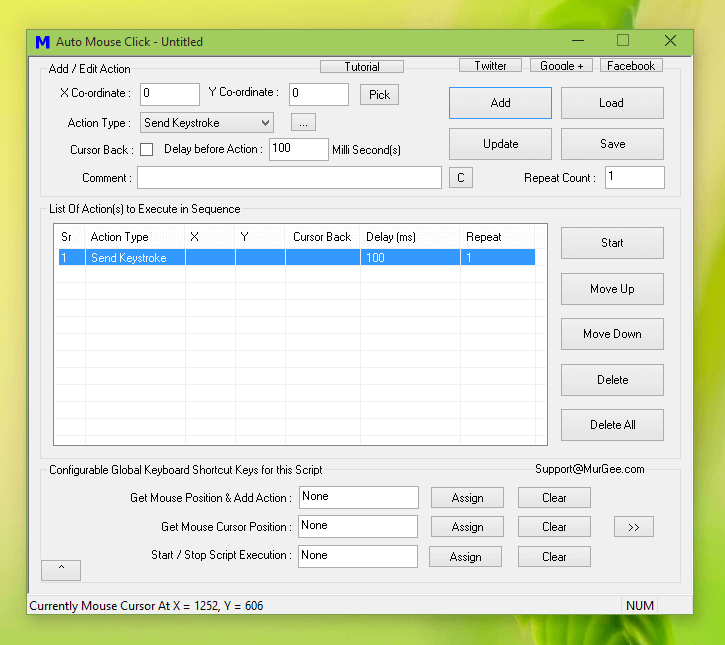 The Screenshot above displays configurable Keystroke for Send Keystroke Action. Note that you can automate sending of Alphanumeric Keys, Function Keys, Ctrl, Shift, Num Lock, Scroll Lock, Backspace and other Keyboard Keys. Yes you can even send the Keystroke directly to an Application Window, irrespective of whether it has Keyboard Focus or not. Finally, you can add other Actions to the Script like Mouse Clicking, Mouse Dragging, Pressing of Enter or Tab Keys and much more. Download this Windows Automation Software and create a Macro Script to press Keyboard Keys as good as done by Humans. Yes you can use this Auto Mouse Click Application as a Auto Key Presser, Mouse Clicker and Auto Key Presser or create any Combination suitable to your purpose. The Auto Mouse Click on Windows 10 Post displays more screenshots and talks in detail about the features offered by this Windows Automation Tool. The Last Application in this Auto Key Presser Post describes an Application which can help you type Long Text sentences. 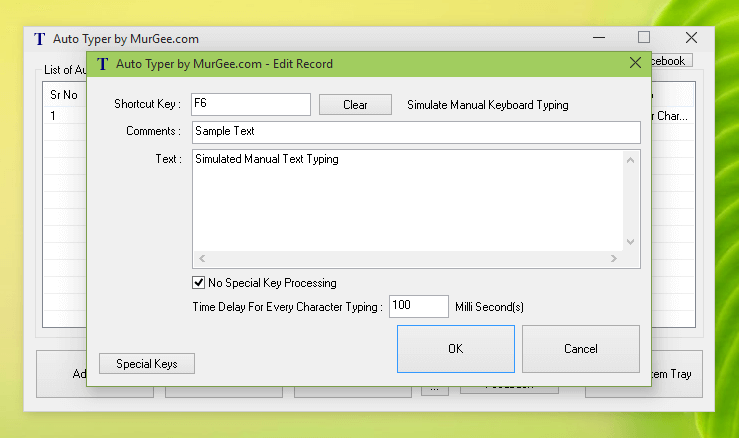 The Screenshot displays a Screenshot of this Software displaying a configurable keyboard shortcut and configurable time delay between typing of each Keyboard Character. The Automatic Text Typing done by this Auto Typer is good as done by a Human. All you need to do is configure keyboard shortcuts along with text sentences and let this Text Typing Software do Automated Typing for you for filling online forms, typing in email signature or anything else. All the above mentioned Keyboard Key Pressing Application work on Windows 7, Windows 8, Windows 8.1 and even on Windows 10. Yes all the Applications work fine on 32 Bit and 64 Bit Windows Operating Systems. In case you do not see an Application that can press Keyboard Keys as per your requirements, do contact Support@MurGee.com and get the new feature Implemented in any of the above mentioned software utilities. Every Key Presser mentioned above is a Free to try Application without any popup reminders for Payment. You can Unlock the trial Limitation of the software by paying in $5.00 Registration Fees and save time and efforts in pressing the same keyboard keys again and again.